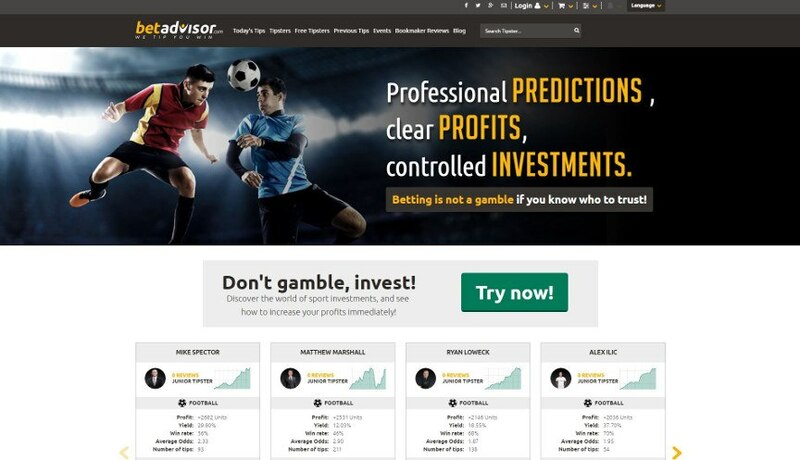 Betadvisor is one of the oldest tipster services online founded in 2010, and #1 in terms of active professional tipsters. You can browse the tips of hundreds of tipsters - you can check and compare their stats going back over a year. To make your decisions easier the website ranks their tipsters by the profit their tips made in units and it calculates the profit you could have made off of them if you enter an amount for stake. If you want to know about short-term stability you can narrow the tipsters' stats down to short periods of time. If you choose to subscribe to a tipster, either free or paid, you get phone and email notifications every time they post a new pick so you can act in time. If a well-known tipster makes a tip waiting can cost you since if many people bet on his prediction, that drives down the odds. Each tipster specializes in a given kind of sports so you can pick the one that suits your interest, the most common being football and horse racing. You get 50% off of every monthly subscription in the first month on Betadvisor if you're a topsters.com user! Use the promo code IR3HJA1Q in order to claim your bonus. Betadvisor makes it easy for you to browse through tips, both free and for sale, sorted by the effectivity of the tipsters that give them. Just click on "Today's Tips" on the top menu bar on the front page, then select either "sale" or "free" from the drop-down menu. This will take you to a page with a selection of tipsters. If you click on "events" on the top you'll find all the games that tipsters made predictions for, if you're looking for a specific event that day, click on the left menu bar where events are sorted by sports. You can log in through your Facebook, Google or Twitter account, but if you wish to deposit money, you have to create a "customer account" - which only takes minutes as well. You can submit tips yourself, and even choose to charge other users for them - so there's another way to make some money on the site besides taking tips. If your performance is good enough, you can move up to be a "junior tipster" after 50 tips and a "senior tipster" after 250 tips, which will increase the number of users who are willing to pay for your tips. To submit a tip, log in, create a tipster profile then click on the red 'insert a tip" button hovering over the page in the lower right corner.